“Components 4” is out now at all good stores. 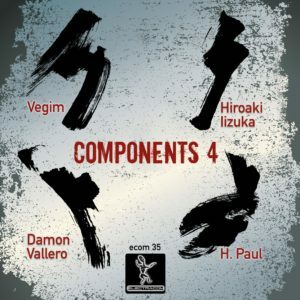 Re-launched twelve years after “Components 3”, the Various Artist series welcomes Vegim and H.Paul to the label and a return for Hiroaki Iizuka along side Damon Vallero The release features four tracks of dark, brooding, hypnotic techno and is sure to do damage across dance floors the world over. “Anxiety” Ep is the latest release on Electracom. Available now at Beatport. The next Ep on the label is another from Damon Vallero titled “Surveillance”. This release features a great remix from Spanish producer Drop-e and will be released on 11th July. Previews available below. Out now on Electracom is the “Safely Hidden” Ep by Damon Vallero. This is a four track Ep and contains a remix and welcome return to the label for Hiroaki Iizuka. “Safely Hidden” previews can be heard below. Damon Vallero on Dave Clarke’s White Noise Radio Show. Listen here. The next release on Electracom from Damon Vallero is titled “Defined Structures” and is out now. Listen to previews below. A new release titled “Relative Exposure” by Damon Vallero will be released on February 2nd. Check the previews below. After a break of four years, Electracom is back with a new release from label owner Damon Vallero. Title “Secure Connection“, Damon delivers four tough and deep techno tracks that epitomise the label’s sound and provide a launch pad to take the label forward in 2014.